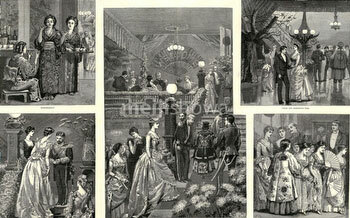 On November 28, 1883 (Meiji 16)	, the Rokumeikan (鹿鳴館) is opened in Tokyo with a gala for 1200 guests. The large two-story building was commissioned by Foreign Minister Kaoru Inoue (井上馨, 1836-1915) to impress Western visitors with its Western look and atmosphere. 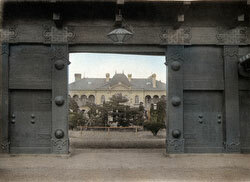 Inoue hoped that the building would help in having Westerners see Japan as an equal civilization-wise, which would aid in renegotiating Japan’s Unequal Treaties. 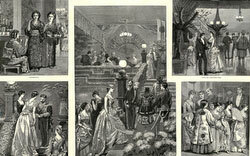 Although Rokumeikan’s parties and balls introduced many high-ranking Japanese to Western manners, its image as a place through which Western culture entered Japan is mostly exaggerated. 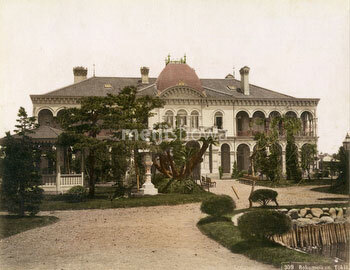 The building was designed by prominent British architect Josiah Conder (1852–1920). The Rokumeikan failed to live up to Inoue’s expectations, and soon lost its popularity.